Three years ago, few of us bloggers from Bangalore had met Bhavana Shankar Rao who had come down from Czechoslovakia to Bangalore. 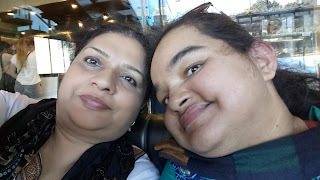 If I try to think back about our meeting on that day, all I can recall is how one of the person I did not even know before the meet, Kiran (Bhavana's better half) mingled with us with comfort. I had asked him during our course of discussion, what is it that interests you most about plants and trees and he promptly answered, "Imagine the water from the soil reaching to the top leaves on a Redwood tree, without any electricity or noise". It changed something in me strongly. Should we not teach ignite the curiosity in children with such sentences so that they go ahead and study more? In fact, the one interesting fact he mentioned ignited a dream in me to enter education sector and start teaching once again. That is another story which I will share some time. Last time it was a pleasant meeting and I was looking forward to meet the sweet couple once again. It took almost three years for that to happen again. Now Farheena has been at home most of the time since last month due to the shifting of her vocational center and delay in arrangement of transport for her due to starting hiccups. She has either been in a Special School or her Vocational Center most of her life, giving me a gap of 7-8 hours to catch up with my personal venture or activities. Since she is home, I have to tag her along with me if I have to go out since she is not confident to stay back at home all by herself. On Tuesday, we both visited HCG where I went on rounds of Pink Hope Mitra Program. We meet newly diagnosed patients and talk to them giving hope. Farheena first refused to come and said she will stay back, then changed her mind again and came with me. She told me that she will sit in the front office and wait for me to finish my work and come back, but will not talk or make friendship with anyone there. I said "OK". Next she sneaked in a biryani treat for her on her way back home. I agreed. As promised, Farheena sat in the front office with two staff ladies, and we went on our rounds. I called them once in between work and was assured Farheena was comfortable and doing fine. The girl kept her promise and behaved in the hospital but refused to talk or make friends there. Also refused to eat anything in the hospital canteen. On my way back, I had few more task on hand to complete and then Farheena got her Biryani Treat. On her way back she wanted a selfie with me and gave a big smile. Again this Thursday when I told her I am going to meet a friend, Farheena said she did not want to join us since she had planned to watch some programs. At the same time, she did not want to stay back alone either. I calmly told her that she has a choice, either join us or stay back.. She requested me to cancel my plan and stay back with her, and I calmly said "NO". So Farheena announced, "I will come with you but I will not talk, smile, eat or drink anything. I will not say Hi as well". I was in a dilemma how to handle this. It becomes quite awkward and embarrassing for me, (and Rayyan sometimes) when Farheena ignores everyone talking to her and pretends that no one around her exists. Some people have even wondered whether they have offended her in anyway until I convince them it is not so, but just one of her moods. Like I did not want Farheena from holding me back in doing what I felt I should in Pink Hope Mitra program, I felt the same here. If I allow her to stop me today, it may change her and me permanently which may not be in positive direction. So I made the big decision, I am going to allow Farheena to be Grumpy and not be affected by it. So out we went to the Cafe. Ever ten minutes Farheena kept asking me "Are we there yet? ", trying out her first trigger. I answered her calmly "not yet", every time she asked her question. Finally I got to say yes. As we walked in, she chose a corner to sit and leaned away from me. I asked her if she would like to eat something or drink a juice or tea, "No" was the expected answer. I bought a pizza and chocolate Mousse and placed in front of her to aim at temptation. No response. We had a good conversation, and enjoyed our time together a lot. There were so many things we discussed about and Kiran had really very interesting stories to share even this time around. We could go on forever, but then time was running out for all of us. Finally, Farheena did not say "Hi", "Bye" or eat anything but sat in her own grumpy way leaning away from me. I finished my chatting with my friends, ate the food and enjoyed the get together with amazing couple I admire a lot. As we sat in the cab on our way home, Farheena said, "I am sorry, next time I will eat something and talk". I was quite excited and wanted to blurt out something, but I remained calm and said "OK". I felt very successful as a mom that day by allowing my daughter to be grumpy and not being affected by her behavior. I cannot actually explain it properly in words, but I feel the sense of pride within me. We always have this urge that our children should enjoy everything we them. Food, clothing, a picnic, or dinner out. When we see they are not enjoying themselves, we get angry and pick up a fight because we feel let down by them or see that they are being ungrateful to us even though we are putting every effort to make them happy. I could have started down the road which took me down the path of "why is Farheena being ungrateful even when I take her everywhere with me, she is so mean, etc etc" but I did not. I realized that there are days when she may not want to enjoy no matter what I gave her. I just had to remain calm. I know some of you may find an urge to judge me on this, but if I am OK with a grumpy daughter I am sure OK with a judgment from anyone.